Hello from Jogja! More specifically, from the safe haven of the school computer lab where there is air conditioning, peacefulness, and most of all, carpet, which means everyone takes off their shoes. After three back to back classes of being on my feet in super hot and muggy classrooms, I couldn’t be happier to set my toes free. I don’t have wifi at home, so I’m going to get right to it. 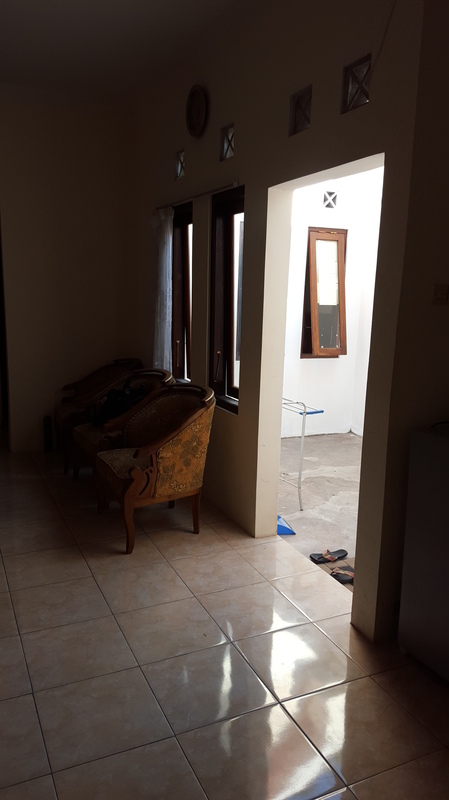 Pics of my new home! 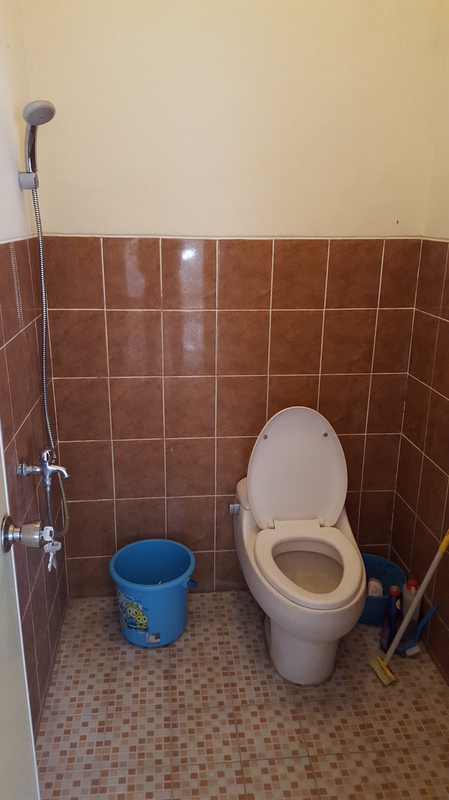 This simple showerhead that only puts out cold water is all I think about towards the end of the sweltering hot school day. Now for my second home. 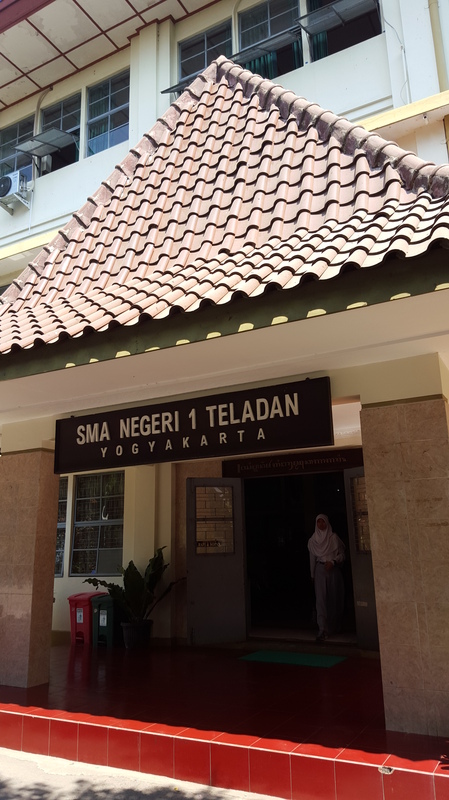 SMA Negeri 1 is a public high school, and from what I’ve been told, it’s also one of the best in Jogja, which is saying a lot because Jogja is a huge center of education. A full score on the national placement exam is 40, and the students at SMAN1 have 37s or higher. In the front lobby is this magnificent display of traditional gamelan instruments. 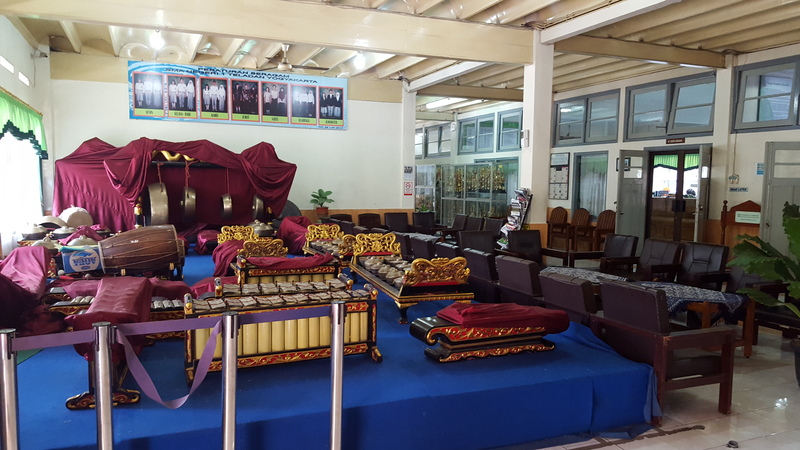 Gamelan is kind of like an orchestra of percussion instruments, and it’s an afterschool activity for the students here at SMAN1. I’m dying to see a performance. Each floor belongs to a grade. 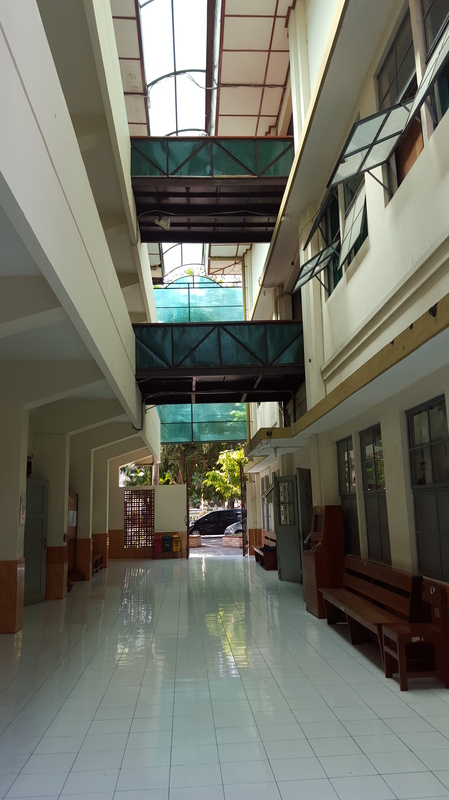 Tenth grade students are on the top floor, which is the hottest floor. Guess which grade I teach. The school library, in which I strategically position myself so that I can oversee the students working on their group projects while being downwind from the air conditioning. 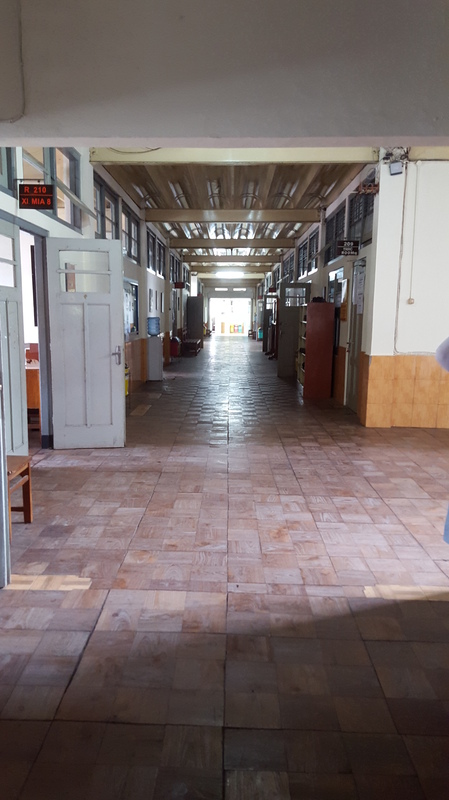 Each classroom is designated for one class of students, and the teachers, not the students, move from classroom to classroom when the bell rings. 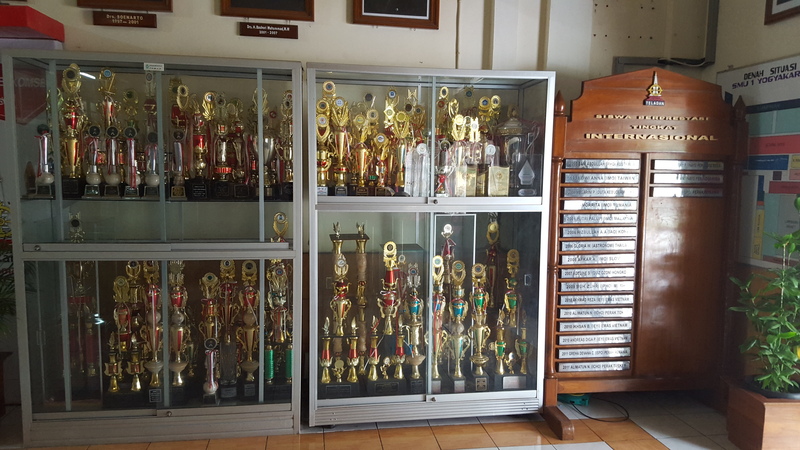 If there’s a portion of a wall long enough to fit a trophy case, there’s a trophy case. Inside are the winners from national competitions in biology, chemistry, physics, economics, etc. I love how open the school is to the outside. 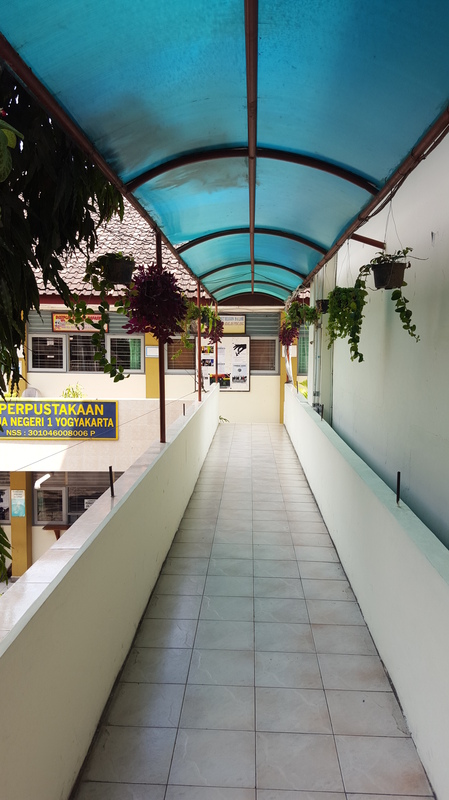 A lot of the walkways connecting the different parts of the school are outdoors, and the walk from the classroom to the library is a breath of fresh air. Even at home, the very center of the house is completely open to the outdoors. It’s great for letting in light and a nice breeze. Terrible for letting in mosquitoes and ants. The ants I don’t mind. The mosquitoes, on the other hand, have gotten every piece of me from my head to my toes. I was slightly shocked when I looked at myself in the mirror for the first time at school (there’s no mirror in the house) and found bites all over my neck. Hickies, my roommate called them. I slept with the covers sealed tight around my neck that night, and I woke up with two bites on my forehead. It’s a good look. It’s a tradition to bring small items to share with everyone as a sign of thoughtfulness when returning from your travels. They also make for good icebreakers. I brought bags of tootsie rolls for the school teachers, and a Rutgers mug and t-shirt for the Headmaster/principal and vice principal. It just so happened that it was also a teacher’s birthday that day, and so before I had even gone to my first class I was being encouraged to try a bowl of green bean soup (which is actually a home favorite of mine, except here they add a spoonful of sticky rice and coconut milk which is as good as it sounds) and different types of noodles (Medan vs. Javanese). I thought my bowl of tootsie rolls would be completely overshadowed by this birthday feast, but a little while later I looked again and the bowl was empty. After I introduce myself to each class, Bu Ami (the Indonesian English teacher that I’m assisting) opens the floor for questions, which gradually emerge from lots of giggles and/or students egging on other students to ask. 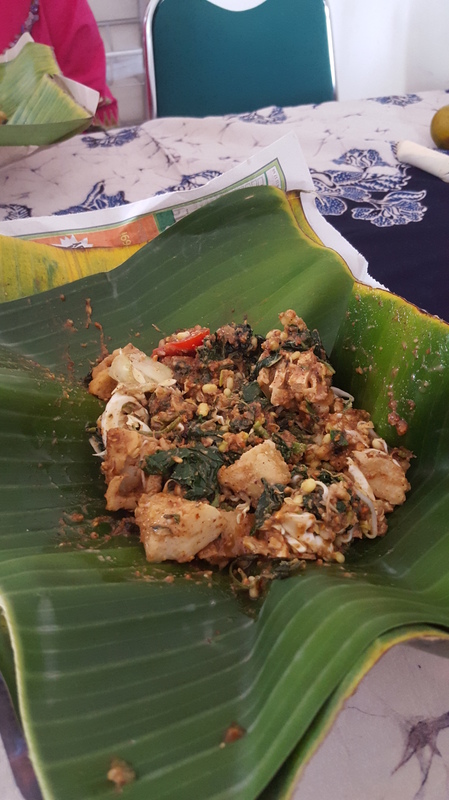 It’s full of vegetables and sticky rice mixed in with a peppery (spicy) peanut sauce. Later that class, three students bashfully presented me with a bag of take-out lotek that they ran out and bought during the fifteen minute break. Then they asked for my picture. Hands down the sweetest thing anyone’s ever done for me. 1) I get such a kick out of their reactions when they find out who is paired with who. The girls are absolutely elated to be partners, and there’s usually a groan when a girl is paired with a guy, but every once in a while the room erupts in OOOOOOOOOOOHOHOHOHs when a particular girl gets paired with a particular guy and I’m just dying to know the back story there. 2) I can go around and talk to the students more candidly. This is when I test the waters and see which students are down to make small talk in English. They usually ask me about America, where I’ve been, or how I’m liking Jogja. A lot of them have never been outside of the island of Java, but they’re all super active on social media. I’ve been asked many times for my Facebook, Instagram, Whatsapp, Line, Twitter, the list goes on and on. They’re incredibly active, and they demand you follow back. Indonesians are possibly the most friendly and welcoming people I’ve ever interacted with. They’re always offering snacks or sweets and asking about where you’re from. A common reaction that I’ve gotten from some teachers and students is “You’re from America? But you look Asian!” The melting pot version of America hasn’t completely reached Indonesia just yet, and American still seems to mean caucasian to the majority of the people here, but after I explain to them that my parents are Chinese and that I was born and raised in America, they seem to get a kick out of the idea that I speak Mandarin in addition to English. Hopefully by the end of this year I’ll be able to tack on Bahasa Indonesia to that list as well. Despite the sweltering heat and humidity, Indonesians dress fairly conservatively and usually wear long pants/skirts and shirts with long sleeves. There is a Muslim majority in Jogja, and most women wear a jilbab, but Indonesians by no means lack creative expression in the way they dress. Indonesians in Jogja wear these beautiful elaborate and colorful patterns – known as traditional batik. Batik is made by crafting extravagant patterns on fabric using a dye-resistant wax so that when you dunk the fabric in a certain color, the parts of the fabric covered by wax remain untouched. 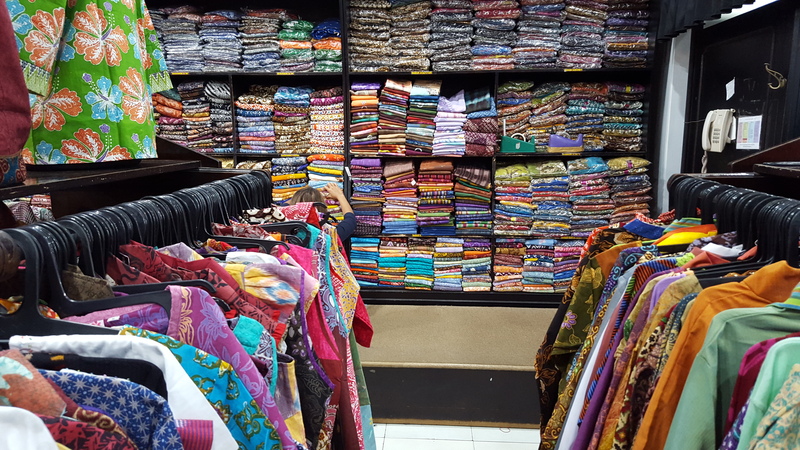 Indonesian batik was designated by UNESCO as a “masterpiece of oral and intangible heritage of humanity.” Seeing as the teachers wear batik to school, I went shopping for batik in the bustling street of Malioboro, where the colors were dizzying and the fabrics never ending. Ta da! 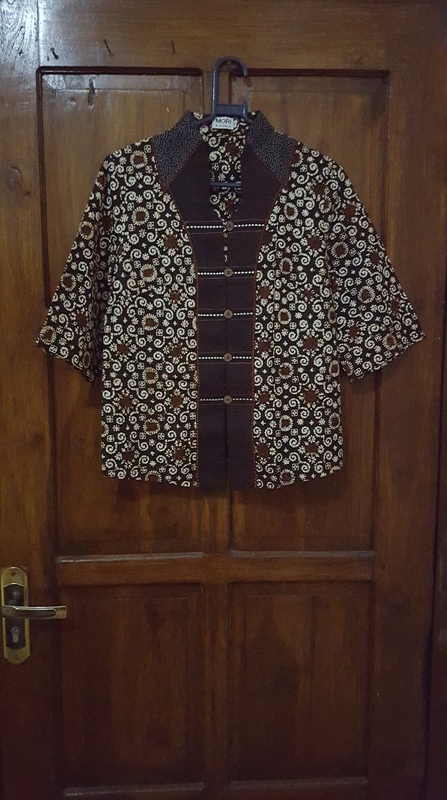 My first, but certainly not last, batik. days until I start a new life in Indonesia. Current feelings: Mostly excited with drops of intimidation and periodic pangs of sadness. Excited because this is going to be a year of huge personal development and adventure, intimidated by the idea of living in a country whose language I am not fluent in, and sad for every goodbye this week that I’ve had to remind myself is a true, lasting goodbye. But let’s talk more about the exciting things. 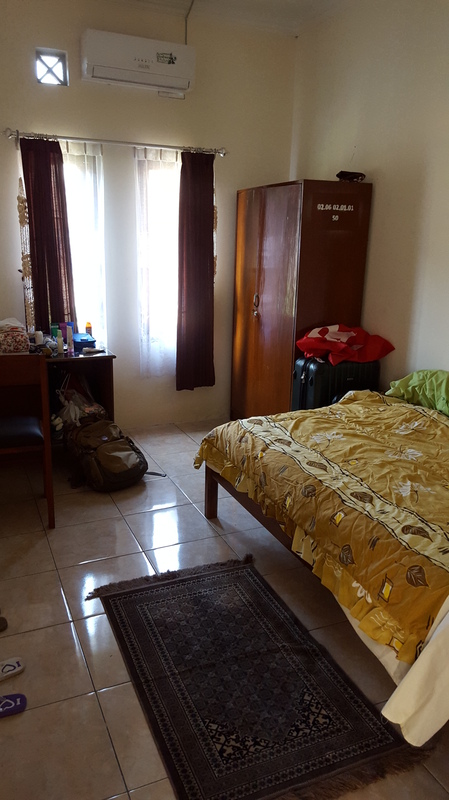 For the next nine months I’ll be living, learning, and teaching in Yogyakarta (also known as Jogja) Indonesia as a Fulbright English Teaching Assistant. 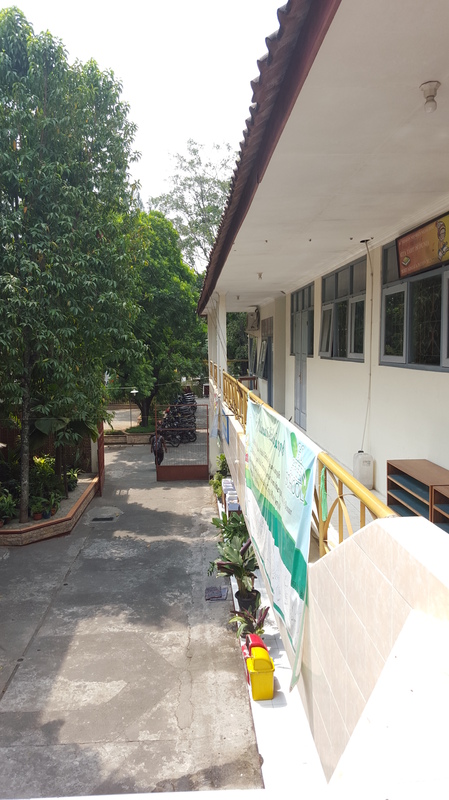 I’m an assistant in the sense that I’ll be teaching alongside an Indonesian teacher in a high school English as a second language class, which is nice because I’ve never taught specifically English before and I’m interested to see what the Indonesian classroom atmosphere is like. Well a) I’m actually working pretty hard to learn Bahasa Indonesia, the national language of Indonesia, via audiotapes and books and such, but b) a lot of these 10th-11th grade students already have a solid foundation of English from years of study, and my presence in the classroom is to be a walking source of English conversation-practice in addition to bringing as much creativity and cultural enrichment as I can to their daily lessons. Cultural ambassadors, they call it. Generally speaking, the Fulbright Program has a larger mission to send Americans to different places in the world, each bringing with them a unique slice of American culture to share with their community abroad, each hungry to get to know the culture and livelihood of the place they’re going to be living in for 9+ months. So what’s in my slice? I just recently graduated from Rutgers University with a major in neuroscience (which makes me very qualified to teach English, right) and I have interests in medicine, bioethics, and public health. It’s these last two interests that have more to do with this nine month endeavor in Indonesia. My favorite topics have always been those that have to do with culture – the cultural clash between Western medicine and traditional healing practices, the cultural gaps between patients and their doctors, whether a health policy actually considers the cultural systems of a target population, etc. I have goals of becoming a physician, but I have more immediate and more pressing goals of becoming someone whose eyes are open to the traditions that communities hold dear and who can understand values and perceptions different from my own. Thus, I’m taking a year off before attending medical school to live and experience an entirely different culture. 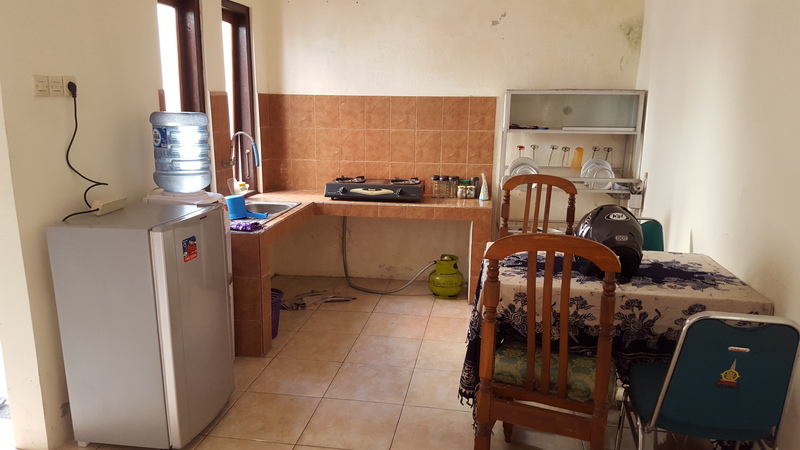 Indonesia, in my opinion, is the perfect country to learn about cultural differences. Just looking at a world map can give you an idea of how many different islands make up this spiraling archipelago, and you can imagine that each of those islands has its own niche of traditions – which, if we’re talking numbers, adds up to thousands of islands, 34 provinces, 300+ native ethnic groups, 700+ local dialects, and six recognized religions. 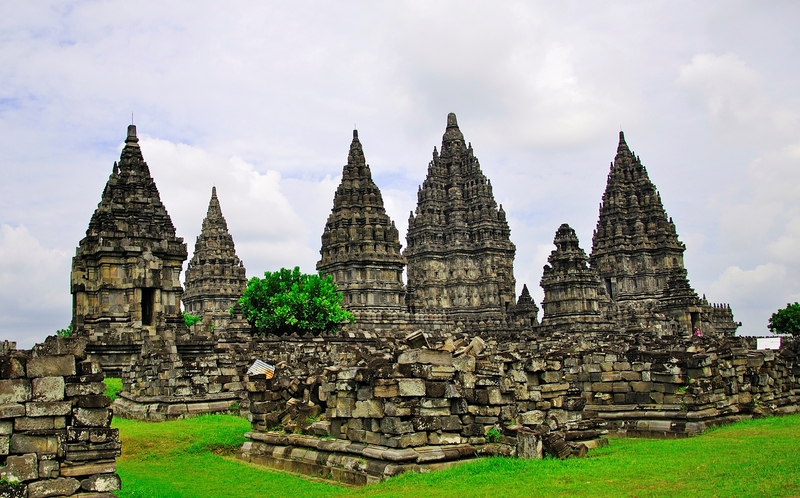 When it comes to ethnic and religious diversity, Indonesia is like a candy store. 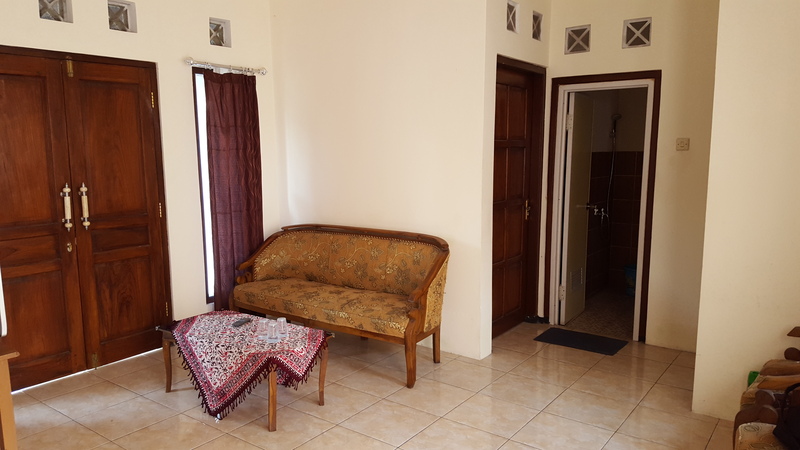 Jogja, to be more specific, is a city on the Indonesian island of Java, and from what I’ve been able to gather so far, it’s one of the great hubs of Javanese culture – rich in arts such as batik, wayang, and gamelan. 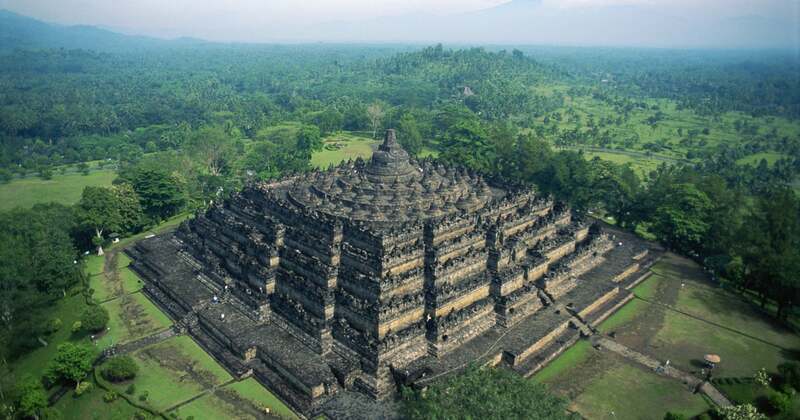 It’s also close to some really mindblowing temples like this one and this one. Until then, I’ll keep saying my goodbyes before they suddenly turn into introductory hellos! two very long plane rides from now.